Those nameless, faceless parenting experts who haunt the back pages of women’s magazines won’t like it one bit but I have a new mantra when it comes to raising my kids – whatever works! That’s why I’m in all sorts of hysterics about this snappy tea towel from the wicked minds at Twisted Twee. Part of Twisted Twee’s hilariously funny but totally irreverent Child Labour Collection, it’s a tea towel that sums up what goes on my house now that my eldest child has passed that helpful but all too short-lived toddler phase. Yes, I’m talking bribery. The silkscreen printed tea towel doubles as a tongue-in-cheek payment chart for dish-drying children. 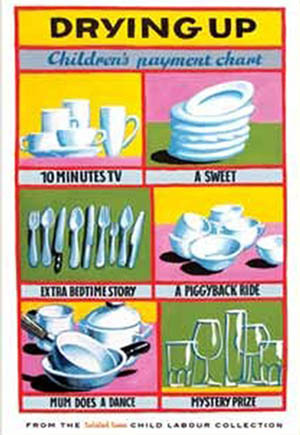 Mugs, it seems, are worth an extra ten minutes of TV (hmmm, substitute Xbox and this could hang on the wall at my place), cutlery scores an extra bedtime story while tackling the plates is worth a lolly. Sweet! But even sweeter is the slogan that accompanies the range – “Let our young embrace drudgery with a happy heart”. See, told you they were wicked. Tea towels cost £10 plus an extra £6 to ship to Australia. Of course, there’s no guarantee these’ll actually get your kids to dry a single dish. But at least you’ll have fun trying! Twisted Twee also have an amazing array of pantlets in styles ranging from the bizarre and topical to the downright cute that will keep your baby or toddler’s nappies covered in style.